I love blogging, I love writing. I have tried my best to write across genres but writing is not yet coming very effortlessly. It is not like breathing yet! When it will come that natural, it will be the day when I would proudly say Writing is in my blood. I wish that day would come soon. But meanwhile awards serves the motivation to reach that goal. Every one needs motivation and person like me need the most in writing. 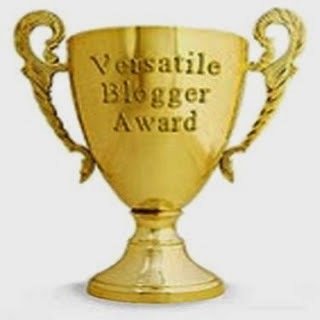 Thank you Amita for awarding the 'Versatile Blogger Award'!! Amita is a wonderful blogger and we crossed our paths while working on a contest by Blogadda. Her fortress is the romantic genre :) Not only she is good blogger but also a good leader and patient human being. She got us up and running for the contest when most of us were cribbing. Thank you Meenal & Sonal for choosing me for the award!! Meenal & Sonal share an inspiring blog space. They write wonderful poetry. They are fellow blog-a-ton writers and winners. I love travelling and planning. I want to travel the Himalayan range. If possible own a beautiful house in the mountains. I love watching films. My favorite films are - Shutter Island, The Matrix, Tangled and many more. I have watched Friends all 10 seasons 5 times and I can watch again but I am holding myself as I then forget my other priorities .. I love watching anime. My favorite anime are - Death Note, Darker than Black and Mushishi. I am exploring this arena..but I mostly stick to sci-fi. I want to visit Japan & China. My dream house would be in Himalayas, traditional/victorian look and furniture, overlooking a flowing river and the peaks and (my favorite part) it will have a library with a huge world map wallpaper, there would be a reading table with a laptop and my kindle. I am and am not introvert. Aesthetic Blasphemy - I love all his writings but I like his abstract the most. SOLILOQUIES - For his one-two-four liners that hold the power of a book. Panchalibolchi - A fellow Blog-a-ton blogger and an inspiration. Embark my words - For his inspiring promise to himself to write everyday and for his romantic posts.